Ruby E. Minor a lifelong area resident and dairy farmer passed away Saturday, April 8th, 2017, at the Northwestern Medical Center with her family at her side. 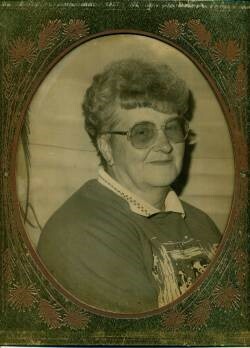 Born in Fairfax on June 11th, 1935, she was the daughter of the late Percy L. and Ethel (McGowan) Corey. Ruby was 81 years old. On February 5th, 1955, in Saint Patrick Church, she married the love of her life, Thomas H. Minor, who preceded her in death on May 16th, 1987. Ruby was a 1953 graduate of Brigham Academy in Bakersfield and a longtime communicant of Saint Patrick Church. She always looked forward to her outings with Betty and Joyce. Survivors include her son, Thomas Minor, Jr. and two daughters, Marie and Marion Minor all of Fairfield; her two brothers, Lyndon Corey and his wife, Joyce, of Fairfield and Everett Corey of Enosburg; her twin sister, Ruth Jerger of Ferrisburg and sisters, Cecile Hutchins and her husband, Clyde, of Frostproof, Florida and Iona Reed and her husband, Robert, of Fairfield, as well as many nieces, nephews and cousins. Ruby is also survived by special friends, the Ryan and Berry families, her feline companions, Bella Jean and Smokey and many friends. In addition to her parents and husband, Thomas, Sr., Ruby was predeceased by her brother, Merton, Godson, Billy Joe Ryan, her special niece, Rita Minor Archambault, her brother-in-law, Alfred Jerger and several sisters-in-law and brothers-in-law. Ruby’s family will greet friends on Tuesday, April 11th, 2017, from 5:00 to 8:00 P.M. at the Heald Funeral Home, 87 South Main Street, St. Albans. A Mass of Christian Burial will be celebrated on Wednesday, April 12th, at 11:00 A.M. in Saint Patrick Church, 116 Church Street, Fairfield with the Reverend Joseph Ikegbunam as celebrant. Interment will be at a later date in Saint Patrick Cemetery. As an alternative to flowers, her family suggests memorials to the Franklin County Animal Rescue, 30 Sunset Meadow, St. Albans, Vermont 05478 or UVM Medical Center, c/o Gastroenterology & Hepatology Division, 111 Colchester Avenue, Main Pavilion, Level 5, Burlington, Vermont 05401. To send Ruby’s family a written expression of sympathy, please go to her on-line guest book at www.healdfuneralhome.com.